Situated on the wildside of cape st francis, this large stand offers nature and ocean views. A level plot in a quiet area with secure views across nature reserve and restricted ocean views from ground level. A sought after property up for grabs. Build your dream home on this amazing plot. 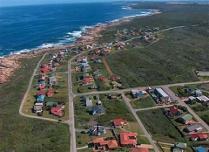 Situated on the wildside of cape st francis with beautiful views of the ocean. This plot is 910 m2 and for sure on eye catch at this reduced price. 5 minutes walk to the pristine white stretch of cape st francis beach. A sloping plot with sea views down the road. Situated in a quiet area close to nature reserve. Build your home double storey and enjoy even a better view of the ocean.